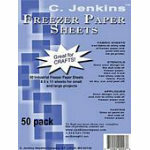 PreCut Industrial XLL Freezer Paper Sheets. Features include a special coating for better adhesiveness to fabrics with a very low heat from any household iron made from a 54lb paper over twice the weight of standard freezer paper to prevent rolling and curling in your printer. 812"X11" sheets. 50 sheets per package. Purchase by the package.